Romney back on top. More evidence that the campaign news matters little. It’s the economy! Summary: Romney edges ahead of Obama in the latest poll, despite a horrific week in the news. 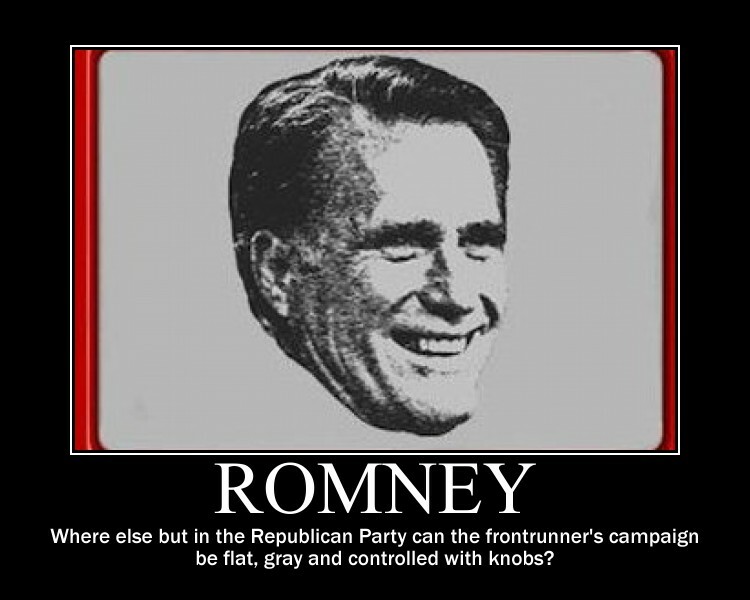 Why will Romney win in November? First, the economy. Second, Americans pay little attention to the election. They vote first on their partisan leanings (quite strong for most people). Second, the decisive variable, the vote based on the economy in the months before the election. The first factor is neutral, since the two parties have roughly equivalent strength (both serve the plutocracy). It’s the economy that will put Romney over the top. — James Carville, strategist of Bill Clinton’s victory in 1992 over President George H. W. Bush. Slowly the deteriorating US economy affects the campaign, as seen in this New York Times/CBS poll conducted July 11 – 16 (full results here). More important is question #5: if the election were held today, who would you vote for? Of course, the election is not over yet. The Republicans’ campaign claims that they have a magic nostrum to bring prosperity. They will spin a victory in November 2012 as a repudiation of the Democrats, of economics, perhaps of arithmetic (see here and here). This shows rational self-government, just like that in a paleolithic tribe. If the rains come we see this as a sign of God’s favor, so we reward the Chief. Failure of the rains shows the God’s anger, requiring sacrifice. Our Constitutional machinery does not work well because of grit in the gears. We’re the grit. Why do awesome people – like us – have such inadequate leaders?, 2 April 2012 — Because we vote. President Romney will prove an effective President, reshaping America for his key supporters, 17 April 2012 — More specifically, for his rich supporters. Next Post Question time on the FM website (& a review of the week). Post your questions and answers! I mostly like this analysis because of the projection for the Romney win. However, I disagree with the notion that voters are paleolithic and that the chief can’t bring down the rain. Can the government hurt business growth? Of course. Taxes are one example. Can the government help business growth? Of course – by reducing those factors that hurt it. So the government isn’t completely powerless when it comes to the economy. Thus Mr. Obama deserves some blame for the current malaise – though I suppose the degree of the blame could be argued. But he’s not a powerless chief – he’s more like the guy at the water plant turning the valves open and shut. Nobody is saying “completely powerless”. That’s a silly exaggeration. There is little polling evidence — looking at both small and large business — that government action is a significant factor in this downturn. Nor is there much analytical evidence that this global downturn is much affected by changes in the US regulation of businesses. I would respond by pointing out that all the local business owners I’ve talked to are, for example, refusing to add new staff until they see how the ACA finally falls into place. I’m sure that’s not the case for every business, but uncertainty and fear of excess regulation are two factors that effect businesses. “Nor is there much analytical evidence that this global downturn is much affected by changes in the US regulation of businesses.” My understanding is that convention wisdom blames lack of regulation (that is, government action) for the current downturn. Consumerism and household debt also played a role, but market forces tend to correct these things in any case. Regardless, the government reacts with the markets in certain clear, verifiable, and proven ways. The market largely dictates American life, but the government can manipulate it. Either you have been selective in your friends (ie, an unrepresentative sample) or are reading your beliefs onto them. There have been many polls about this, by many polling firms. Overwhelmingly they don’t agree with your view (some were specifically crafted to produce politically desired outcomes, so I suggest relying on those by the major firms). For example, the June 14 poll by UPI found that small biz owners back Obamacare. That’s logical because it provides them with substantial subsidies. Here’s just one example. For those of us in the business world it is very clear that the uncertainty surrounding government is holding back hiring. This could be resolved by concrete government action in any number of ways. Yes, that’s the kind of politically-driven poll I mentioned. The national Chamber is dominated by its large-corporate members, and has become a highly partisan right-wing lobbying group. It’s ads opposing ACA have been repeated cited by neutrals, such as Factcheck.org, for their eggagerations, misrepresentations, and outright lies. No surprise that it contradicts reliable polling data. Tax cuts have been the largest single fiscal response to the recession since 2007, by both Bush Jr and Obama. Obama actually wants to extend some of the Bush tax cuts and eliminate others. But my assertion that taxation effects the economy is accurate. The simple economic principle of deadweight loss clearly shows a reduction in consumer and producer surplus and a removal of market ulitity as a result of a tax. Instead of “less is more” we get “less is even more less,” so to speak. And no other agency besides the government taxes. Please re-read my comment. This is not a matter of theory but fact. Voters respond to the present state of the economy, largely the result of trends during the past few years. During that period there have been repeated and large tax cuts. There is zero evidence that business or consumer behavior changes on the basis of proposals by the President that have not even been considered by Congress. When people look at such issues and reason on the basis of theory from first principles, the result is almost always false. In my experience it’s usually because they wish to ignore the actual data. When you insert “that have not even been considered by Congress” into the conversation we’ve changed the subject. I’m talking about specific proposals the President has had passed (the ACA being again just one example, the payroll tax cut is another). But yes, the larger point is that government is not a powerless chief, and neither is the President – he has the bully pulpit and the ability to compromise. That is essentially what I said in my first comment. Last warning: stop making comments to the effect that “government is not powerless”. Nobody is saying anything so foolish. Nothing even remotely like that. It’s troll-like behavior. I am specifically disputing this section right here.^ Am I misinterpreting in? I don’t know if you’re misinterpreting it. How is the section (which is pretty obviously a light metaphor) related to what you’re saying? I don’t see the match. In any case, in the interest of clear communication — if that’s what you’re respond to, please say so. Nor is it necessary to make so many comment saying the same thing, unless you’re responding to somebody disputing it. That’s odd. All of the local business owners I’ve talked to are ignoring ACA in their hiring plans. Either they already meet the insurance requirements or they aren’t affected because they are too small. Perhaps you can point to some reputable sources that support your position? You are right and the markets can manipulate the government as well. It appears to me that the markets are winning right now. Expenditures, taxes and debt all play on the economy (http://www.investopedia.com/university/macroeconomics/macroeconomics10.asp#axzz215b1Yqej). In fact, some markets exist solely based on government actions (the bond market). To suggest that government policies don’t effect the market is to bury one’s head in the sand. And if the markets were winning, we wouldn’t have things like Dodd-Frank or some of the banking reforms but in place during the last 5 years or so. Please stop making stuff up like this. You’re probably well-intentioned, but it is trol-like behavior. Nobody is saying “govt policies don’t affect the market”. In fact the previous comments say the exact opposite. BTW, it is totally false to say that the bond market exists “solely besed on government actions”. Government actions, both regulatory and monetary policy, have a large effect on bond prices. But there are many other powerful factors, such as private sector’s supply and demand for funds and preference for liquidity and risk. There’s a market for municipal bonds – bonds floated by local government. This market is based on government action – that is, borrowing. The prices in the markets of course derive from supply and demand of the many buyers and sellers within it, but the market would not exist without a government action (borrowing). I’m saying the government determines the buy/sell prices, no one is. That’s just as much isogesis as what you said I did earlier. What I am saying is that the government has power to effect market outcomes and is not powerless, and the president, as head of 1/3 of the government, thus has the ability to alter that outcome – though to what degree he can and should is a matter of debate. That does not even remotely support your statement that the “bond market exists soley because of government actions”. Banks and retailer issue bonds. Does that mean that the bond market exists “solely because of banks & retailers actions”? (2) “I’m saying the government determines the buy/sell prices, no one is. Can you cite a source for such a weird statment? Yes, you keep saying it. Since nobody disputes it, it’s why I increasily suspect you’re a troll: repeatedly making provocative & irrelevant statements that disrupt the thread. (1) If the government didn’t borrow, we wouldn’t have a bond market. So I think that’s accurate. (2) Meant to say *doesn’t determine,* a typo on my part, which I agree makes that statement weird. (3) Well it’s true. And I’m arguing against that italicized quote at the end about the chief having no power over the rains. I think that’s relevant, and just because I disagree with you doesn’t mean I’m a troll. False. There is a bond “market” so long as there are entities issueing bonds. As I said before, like banks and retailers. We have a stock market, but the government does not issue stocks. Agreed that’s relevant. Now that we know what you’re talking about, the matter is easily explained. Why the analogy (more of a loose metaphor) between a Chief controlling the rains and the President controlling the economy? (a) There are four major methods by which the government can stimulate the economy. The fastest to use and most powerful over short time horizons (1 year or so) is monetary policy. That’s almost totally under the control of our independent Central Bank, the Fed. The only influence the President and Senate have is appointing new members. There are 7 members; they have 14 year terms — so its a slow process! The other major level is fiscal policy. Spending (especially for new programs) only slowly affects the economy. And the President helps set the budget, but the dominate influences are the senior members of the House and Senate. The third tool is regulatory policy, especially over the banks. Much of that is vested in bodies which (like the Fed) the President influences by appointing members over time. The Treasury Secretary has some influence, but is only one agency among the many Federal and State players. The fourth tool is taking measures to directly affect the exchange rate of the US dollar. The Fed’s monetary policy usally has an every stronger effect, along with macroeconomic variables such as the trade balance, inflation, and growth. Also, exchange rates are relative — the dollar vs. the currencies of other countries. So our policies and national dynamics are only half the equation. (b) The other reason the President’s ability to influence the economy is limited is the immature basis of economy theory. Much of what Dynamopolitics has said about the economy is either exaggerated or questionable. For example, what are the effects of regulation and taxation? In the post-WWII era the US grew faster before the era of deregulation and tax cuts that began on a small scale with Carter and large-scale with Reagan. More evidence, in the past decade the high-tax high-regulation Nordic countries and Germany have done better than the US. These things are complex and poorly understood. Agreed; nobody said so. It was the repeated assertions — as if someone was disagreeing with you — that were troll-like. Especialy when I said — several times — that you nobody believed the extreme statements you were arguing against. It became clear when you eventually explained. By the way, America is not really like a paleolithic tribe. That too was a metaphor. As a young adult America always seemed like a place for a lifetime of opportunity: with a little hard work and dedication anything is possible. I used to love the ideal of America. America is a stream. If flows by, and must be re-created anew by each generation. The America you saw was in the history books (ie, the past). The America you see today is the America we’ve built, and will hand down to our children. Fab Max, I think your are right on you statements about the Bond market. Some entities just happen to be Governments as opposed to private businesses..
It’s astonishing how old are many forms of economic activity. Almost everything that makes our economy work (modern in the sense of since 1800) was present in ancient Babylon. Probably bond markets as well, in the sense of trading IOUs (which is the essence of a bond). So the economy is teetering and people start to favor ‘the other guy.’ Hardly surprising. Personally, I’m convinced that no natural growth returns to the economy, whoever is elected, until the private sector debt is payed down, and this is decades off. So, if it’s any consolation, Romney ends up one term also as every policy to stimulate growth misses the real issues and fails. Japan has been going through this same thing. Obama does represent the most colossal wasted opportunity to reform the economy in my lifetime. I remember the early days of his Presidency and everyone was waiting for what the plan was to resolve the financial crisis. He had a massive political capital built up, the guy could have done anything and the country would have followed. It was going to be more like Sweden and less like Japan, and what do we get? Continuation of Bush policies, bank bailouts, no prosecutions, and finally “The private Sector is doing just fine.” Obama goes for the Jedi mind trick. No wonder nobody cares. Richard Koo, the brilliant head of Nomura Research, published a new report “Worrisome Thoughts”. Based on Japan’s experience, which the US and Europe are following in our own ways, he suggests that neither low real interest rates nor inflation will do more than mitigate the pain. Since those are two of the most powerful tools of monetary policy, that’s bad news if correct. It’s worse than bad, since fiscal policy action appears unlikely anytime soon — and Koo believes that’s the only tool that will work. I agree. For details see America is rich and powerful because we can borrow. Will this debt build a stronger America?, 5 June 2012 — and the many previous posts about this listed in the For More Information section at the end. Obama must have done something to anger the Economy Gods. In the 1930’s, FDR won back the gods’ favor with the Agricultural Adjustment Act – burning surplus crops, and killing off excess livestock as a sacrifice to appease them. As I remember last election, McCain was ahead until the stock market went down and Obama seemed to handle himself better and the delusion of Palin being anybody you’d want to trust in a crisis dissipated. The economy in the few months before the election was key. So how about: “nice market you got there, too bad if something happens to it in September” sort of thing. America’ real economy may already be in Recession so people are not feeling happy to begin with. Conventional wisdom says Bernanke’s hands are “tied” because it’s too close to the election and he’s done enough on the monetary side. Then the market sells off and peoples’ $20,000 IRA savings for retirement gets hurt. Romney wins. Shortly after he takes office Bernanke initiates the mother of all QE and a Republican congress turns on the spending full blast. Cheney reminds the Nation that under Republicans, deficits don’t matter. A grateful America gives thanks. Of course next year a President Romney could squeeze the austerity vice on ordinary people and channel an economic version of Churchill, a policy of patriotic blood sweat and tears for the little people and tax breaks for the job creators. Just thinking out loud – or perhaps just feeding my own morbid imagination. These days who can say what’s realistic or fantastic? In the For More Information section you’ll see my best guess: whoever wins will do much the same thing (broadly speaking, although to different degrees). Cut social spending, slightly reduce military spending, raise taxes, take the first steps to radical reform of health care. Like most big changes in US politics, these will happen only when a large majority of the public believes necessary and appropriate. Fortunately for our ruling elites, the massive propaganda campaign of the past several years (when did it start?) has laid the groundwork. Fabius, you said that the campaign news matters little. What, if any campaign news are we ignoring that would cause people to vote for Obama instead of Romney? I do not think Obama is sunk yet, although he is taking on a bit of water. So it’s a bit early to be doing a post mortem on his Presidency. But. If I were, I would avoid (At least in this comment), policy specifics, and simply say that time is precious. Four years was not a lot of time to address the inbox that he inherited, especially the damage from the 2008 financial crisis. But Obama made poor use of the time that he did have. (1) Recent “campaign news” that should, in theory, help Obama. (a) The Bain Capital fiasco. Shows Romney to be a serial liar. It’s his first recourse. Why not? It works. In politics, like war, professionals eventually do what works. At the start of WWII US civilian and military leaders strongly denounced bombing cities. (b) His refusal to release his tax returns, as every other major candidate has done starting with Carter. They must contain something very ugly. (c) His failure to move to the center in decisive fashion, or denouce at least one of the crazy elements of his coalition (as Clinton famously did with Sister Souliah in 1992). Two missed opportunities are joining the GOP leaders denoucning Representative Bachman and his speech to the NAACP. Agreed. It’s still early days. As I said IN RED near the end of the post. Disagree. He made very good use of his time. He continued Bush’s bailouts of the banks, and fought to prevent their re-regulation. He continued the tax cuts on the rich and businesses. He not only continued Bush Jr.’s foreign policy, protected its people from well-deserved prosectuion, but also institutionalized many of its most extreme aspects. In brief, Obama well-served America’s stakeholders. For this he will be richly rewarded when out of office. As was his Democratic Party predecessor, Clinton. Perhaps you believe that Obama poorly served the majority of America’s people. Macht nichts. What matters in shaping events are the needs of the shepherds, not the sheep. This post seems like a rare gaffe for FM. Do you have any evidence that this is anything more than the typical fluctuation in polls we see in every political campaign? When it comes to the past four presidential elections, which candidate was described as having better judgment in a crisis? Being willing to take an unpopular stand? What about getting things done? Being honest and truthful? Or simply being able to better connect with ordinary Americans? Well, the Pew Research Center has been measuring these 5 personal traits in the major general-election candidates since 2000. — Source: “Measuring key presidential candidate traits,” Steve Lovern, msnbc news, 19 July 2012. Why is anyone wasting time refuting his tripe? He’s merely regurgitating the “confidence fairy” nonsense Paul Krugman has repeatedly debunked. See ” Death of a Fairy Tale“, New York Times, 26 April 2012, for the latest example. DynamoPolitics boasts that he’s “in business.” It remains a mystery why American businessmen haven’t got a ghost of a clue about basic economics — but the fact remains, they don’t. The U.S. Chamber of Commerce has been lobbying relentessly for economically illerate destructive austerity policies that are not only bad for America as a whole, but are bad for business as well. In America, businessmen seem to delude themselves that whatever is good for an individual business must be good for the country as a whole. This is so economically ignorant, words scarcely exist in the English langauge to describe this level of folly and cluelessness. In a recession, what’s good for an individual business — paying down debt, reducing spending, firing employees to reduce fixed labor costs — is terrible for the economy as a whole. The economy as a whole thrives when businesses take on loans to expand their operations, increase their spending to buy more equipment, and hire new employees to handle increasing demand. Any first-year Econ 101 students understands this: but American businessmen cannot seem to grasp these elementary rudiments of basic economics. Whenever a businesman opens his mouth about economics, in my experience, folly and gibberish ensue. You could easily be right, in the sense of this proving to be an incorrect forecast. Predicting the outcome of elections is a highly speculative activity! And, as I said, it’s early days yet. No evidence, not the slightest. I believe we all understand that these kinds of speculation are just guesses. I beleive that the economy will worsen, and history strongly suggests that means Obama will lose. Saying Romney will win is a likely (not certain) result based on a guess. That’s a good question. I have had scores of such extended conversations with conservatives about economics. In general they’re indoctrinated with layers upon layers of falsehoods. The interesting and consistent thing is their responses. When something they say is clearly disproven, they respond with something else — usually another false statement of theory or fact. When that’s disproven, they give another. Eventually (not a joke, this is serious) they will give the first one. Never — not once — have I seen any evidence that they learned anything at all from the dialog.